Will you be lonely this Christmas? For most people this is probably the busiest time of year. Nights spent at parties and catching up with friends, culminating with a Christmas surrounded by family. But the festive period is not like that for everyone. Age UK estimates about 450,000 will be spending this Christmas alone. A combination of the ageing population and the fact families are dispersed across the country - and abroad for that matter - means it is not always easy to get together. Caroline Abrahams, of Age UK, says it is a "chilling" thought, which combined with the shorter days and poorer weather, results in the festive period being one of the most vulnerable times of year for the frailest in society. Research for the Campaign to End Loneliness shows that more than half of over 75s now live alone with many saying that television is their main source of company. One in 10 report only having contact with family, friends and neighbours once a month. 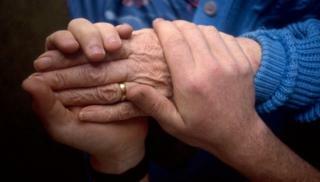 It equates to over 800,000 people in England being classified as "chronically lonely". Kate Jopling, director of the Campaign to End Loneliness, says the situation is "shocking" and desperately needs to be addressed. She says research has shown showing that loneliness can have significant impact on health - both mentally and physically - with one study even suggesting that it was "as damaging to our health as smoking 15 cigarettes a day". To be fair, the government and NHS has recognised there is a problem that needs addressing. A Winter Friends campaign has just been launched appealing for a return to an "old-fashioned sense of neighbourliness" by encouraging people to check on elderly friends and neighbours over the winter months. The aim is to get 100,000 signed up to free alerts that reminds them when bad weather is forecast and gives them tips on how they can help. Setting aside time aside to drop in on an older neighbour or friend once a week - more often if the weather turns very cold. Checking their home is warm enough. The main living area should be around 21°C and bedrooms should be 18°C. Making sure the person is eating well and has some non-perishable foods in the cupboard in case they can't leave the house for a few days. Offering to pick a prescription or giving them a lift to the GP - many elderly people take regular medicines. Helping to keep them active by offering to walk with them if they are not confident, clearing snow from their path and making sure they have grippy shoes and a good coat, hat and gloves. Meanwhile, a 24-hour phone service - Silver Line - has also been launched with Lottery money to offer the over 75s friendship, information and advice. These initiatives will no doubt help. But with the social care system under such strain (councils are cutting back on the home help they provide) not to mention the concern over the cost of energy, it promises to be a tough few months for many.